Buried in the Topeka Cemetery Section 81, Lot 227, Interment #15528 on 4 Oct 1918. Buried in the Topeka Cemetery Section 81, Lot 226, Interment #15536 on 11 Oct 1918. 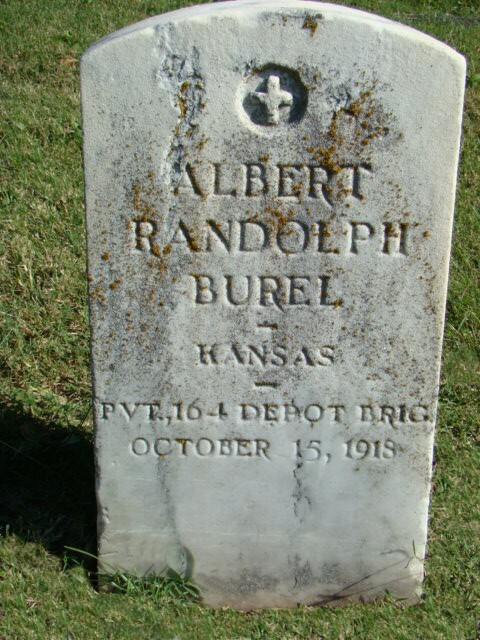 Buried at Rossville Cemetery, Shawnee Co., KS Section 5, Lot #15 on 18 Oct 1918. Buried in the Topeka Cemetery Section 81, Lot 115, Interment #15540 on 14 Oct 1918. Buried In Mt. Auburn Cemetery, Topeka in Oct 1918. Buried in Oak Ridge Cemetery, Perry, Jefferson Co., KS on 20 June, 1917. Buried in Wisner Cemetery, Cuming Co., NE. Buried at Topeka's Grantville Cemetery, KS on 15 Oct 1918. Buried in the Topeka Cemetery Section 81, Lot 191, Interment #15544 on 16 Oct 1918. Buried in the Mt. Auburn Cemetery, Shawnee County Section 023, Lot 009, Interment #0924. Buried in the Topeka Cemetery Section 73, Lot 10, Interment #15335 on 18 Mar 1918. Buried at Mt. Hope Cemetery, Topeka, KS Section 9, Lot 339, Space 3 on 29 Oct 1918 - Note: No headstone. Buried at Shelbina Cemetery, Shelby Co., MO. Buried in the Mt Hope Cemetery, Topeka, KS Section 8, Lot 564 Space 9 on 10 Nov 1917. Buried in Arlington National Cemetery Site 20339. Buried in the Mt Calvary Cemetery, Topeka, Section 07, Lot 19-E-W, Interment #304 on 20 May 1917. Buried in Topeka Cemetery Jewish Section Lot 10 on 3 Jan 1919. Buried in the Gypsum Hill Cemetery, Salina, KS. Buried in Mt. Hope Cemetery, Afton, Ottawa County, Oklahoma. Buried in the St. Francis Cemetery, Ellis Co., KS. Buried at Rochester Cemetery, Shawnee Co., KS Section 10, Lot 1087, Interment #3324 on 7 Oct 1918. Buried in the IOOF Cemetery, Smithville, MO on 31 Oct 1918. Buried in the Clinton Cemetery, Douglas Co., KS Plot: Section 1 Lot 60. Buried at Osage City Cemetery, KS Section 73, Lot 02 on 15 Oct 1918. Buried in the Topeka Cemetery Jewish Section Lot 47 on 18 Oct 1918. Buried in the Topeka Cemetery Section 75, Lot 122, Interment #15706 on 28 Jan 1919.